THOUGH IT DABBLED BRIEFLY with more performance-oriented racing designs during the 1980s, the well-known Swedish builder Hallberg-Rassy has traditionally focused on creating moderately proportioned cruising boats with understated modern styling. The HR42E, so designated in honor of its designer, Olle Enderlein, predates its immediate successor, the HR42F (designed by German Frers), and was built from 1980 to 1991. 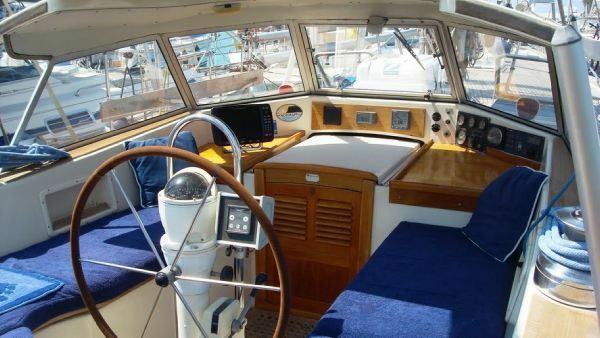 It is one of the purest expressions of the Hallberg-Rassy ethos and features all of the firm’s signature design elements–a center-cockpit layout, a flush teak deck crowning a high-freeboard hull, a distinctive fixed windshield, and a well-appointed mahogany interior. There are smaller Hallberg-Rassys that attempt to blend these same ingredients in more compact packages, but 42 feet is about the minimum length required to make it all work properly. In all, 255 HR42E hulls were launched during the boat’s 11-year production run, only a few of which were sold into the North American market. Good examples are routinely found all over the world, however, including in the Caribbean and, of course, in northern Europe. 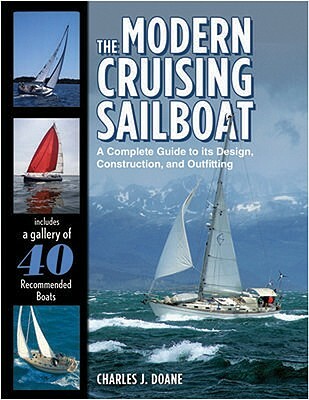 Cruisers who value these boats are often willing to travel some distance to obtain one. Hallberg-Rassy is one of the most respected builders in Europe and its reputation is reflected in the 42E’s construction. Build quality, both structurally and cosmetically, is very good. The hull is solid fiberglass stiffened with stringers and fully tabbed bulkheads; the deck is cored with PVC foam. The joint is glassed over, so the hull and deck together form a monocoque structure; the iron ballast is encapsulated within the long fin keel. Most 42Es have integral fiberglass water tanks that are bonded to the hull (further stiffening the structure), though a few have stainless-steel tanks instead. In all cases the fuel tanks are stainless steel and come fitted with sump pumps, a useful detail neglected by most builders. The rudder, mounted on a full skeg, is built around a bronze stock, an impressive feature in a modern boat. The one significant long-term maintenance headache is the teak deck, which eventually must be removed or replaced. 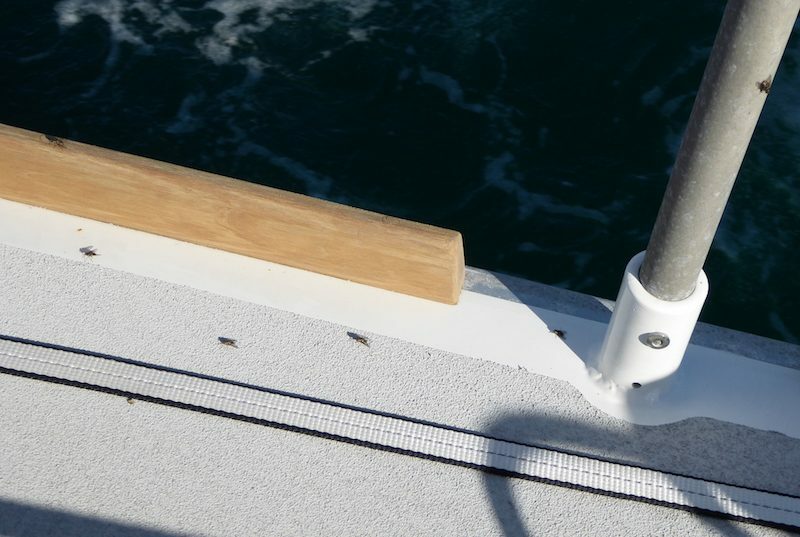 Though glass decks are far easier to care for, most owners elect to replace the teak to maintain the boat’s appearance. 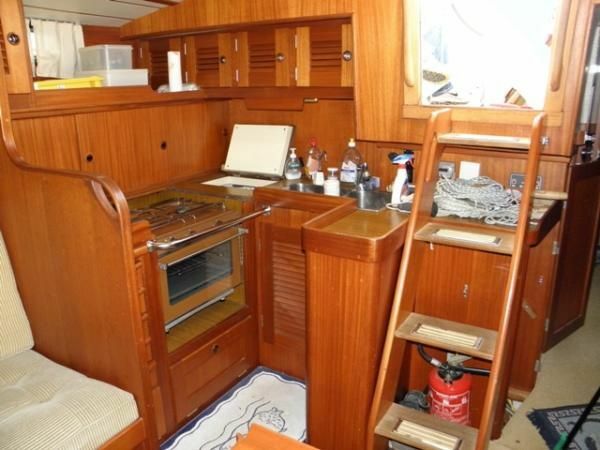 The interior joiner work is excellent and features a wealth of hand-rubbed mahogany, both in bulkheads and in the furniture components. 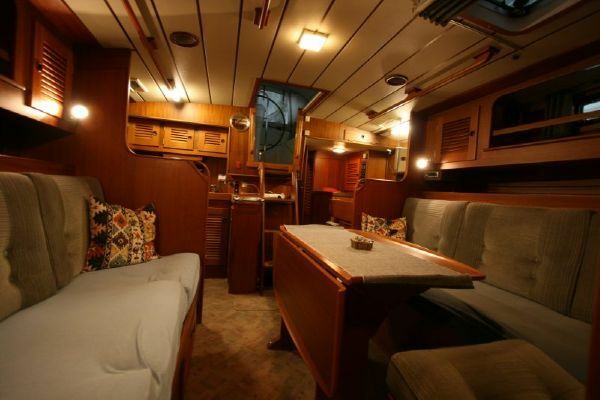 The accommodation plan is straightforward for a boat of this type, with the exception of the great cabin aft. 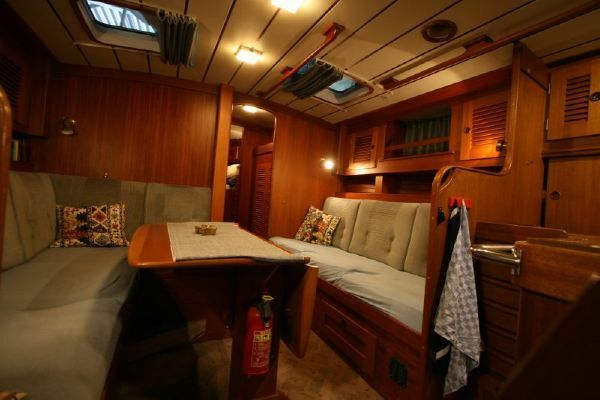 This features a split single and double berth arrangement rather than one large island or athwartship double. 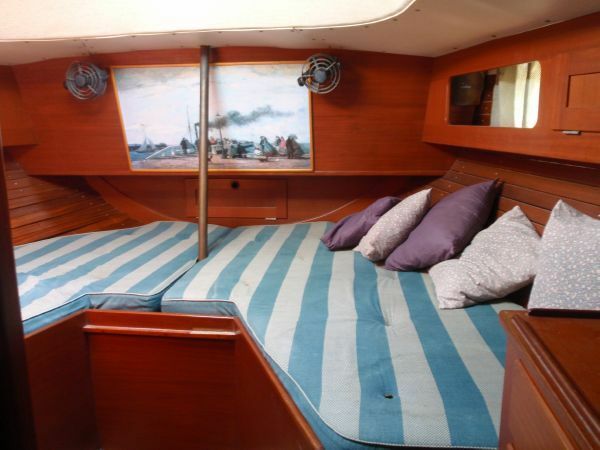 The split-berth arrangement is preferable when the boat is underway, as two persons can sleep more comfortably in a seaway in separate lateral berths. 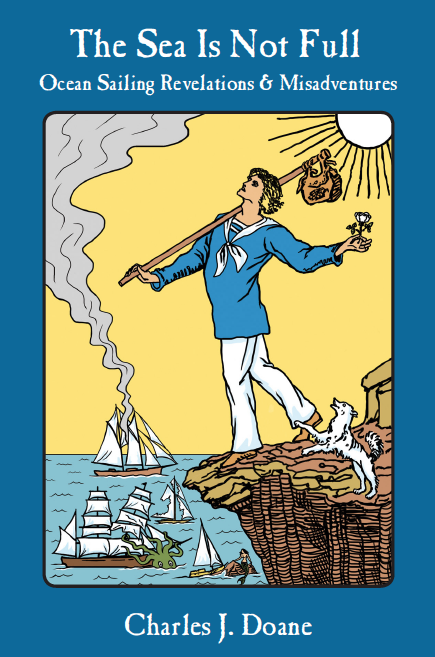 The double to starboard may seem a little tight for two, however, when the boat is in port. Also, the en suite head does not include a separate shower stall, though the forward head, just abaft the forward stateroom, does. Some owners may therefore be tempted to claim the forward V-berth for themselves, leaving children or guests to enjoy the more spacious aft cabin. The saloon, with opposing full-length settees separated by a fixed drop-leaf table, has not two but three potential sea-berths, as the back support for the starboard side settee can swing up to form an upper pilot berth. The boat can thus theoretically sleep a total of eight people, though it will be most comfortable for four or five on an extended cruise. 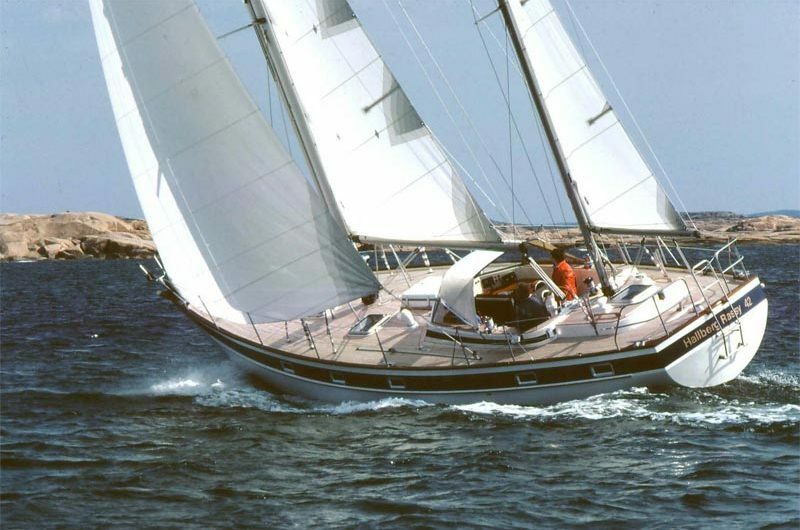 As for its sailing characteristics, the 42E has four different configurations, in that it was sold as either a ketch or a sloop with a deep or shoal keel. 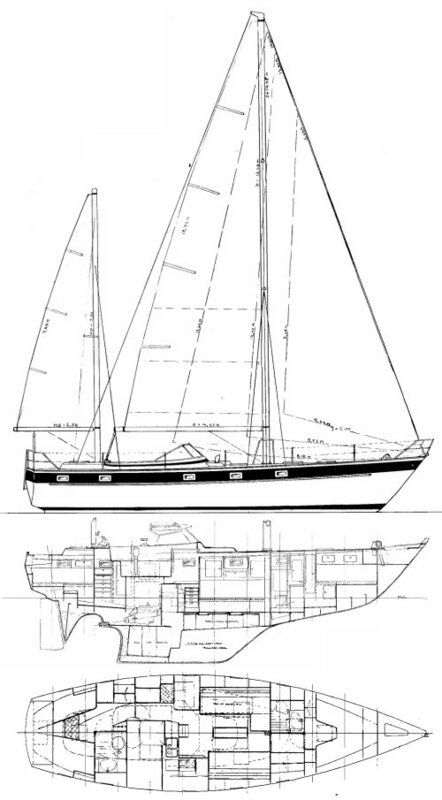 Those most interested in windward performance should favor the sloop rig and deep keel; those who cruise in shallow water and prefer sailing with the wind on the beam will prefer a ketch rig and a shoal keel. The vast majority of 42Es were delivered with deep keels (a reflection of its European origin) and a somewhat smaller majority are rigged as ketches. Take a peek below the waterline, and you’ll see the boat’s hull form is quite conservative. The keel, though technically a fin, is but one step removed from a classic CCA keel with a cutaway forefoot. The boat’s performance, therefore, is solid. It tracks well in a seaway, has a comfortable motion, and is exceedingly stable, thus has a great reputation as a bluewater boat. It is faster and more weatherly than most full-keel boats, but is easily outperformed by more contemporary designs with longer waterlines and shorter, more efficient underwater foils. 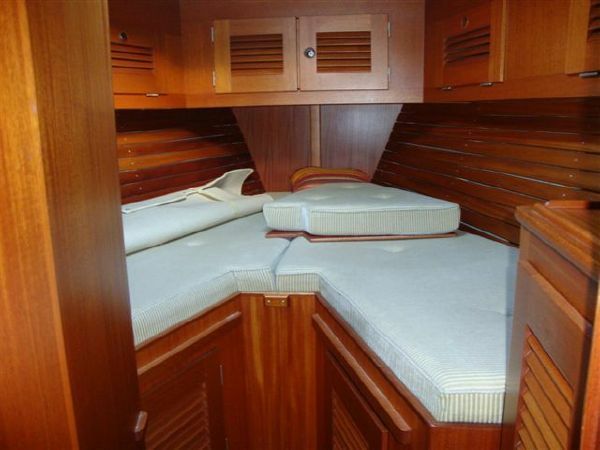 Those interested in a fast coastal cruiser may therefore find this boat disappointing. For cruisers who rely on engines as much as their sails, the 42E (as is true of most Hallberg-Rassys) is a very efficient motorsailer. The four standard engines installed over the years (all four-cylinder Volvo diesels) range from 52 to 62 horsepower and reportedly are capable of pushing the boat at close to hull speed. Fuel capacity is generous enough to take advantage of this in most circumstances. In terms of its systems, the 42E is a class act. The standard battery bank, consisting of four 125-AH 12-volt batteries, was considered large in its day. Some may now find it necessary to upgrade to accommodate more modern power-hungry appliances. The standard alternator, rated at 55 amps, is admittedly quite small and should definitely be replaced with a higher-output unit. The factory-installed wiring is very well organized and is neatly routed through conduits, so it is easy to upgrade if desired. 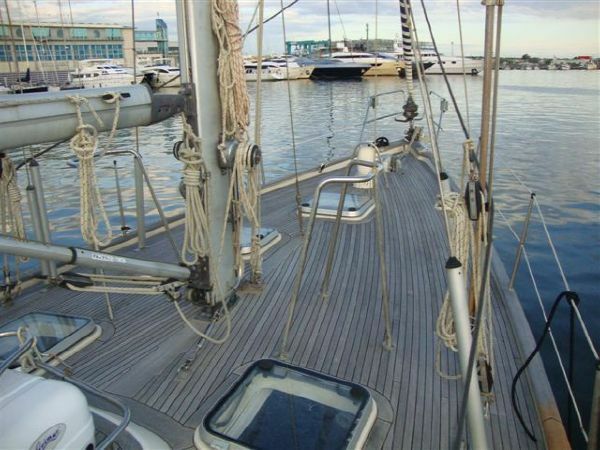 Many owners have spent considerable sums improving these boats and a large number of 42Es now have such posh amenities as bow thrusters, AC generators, watermakers, air conditioning, electric winches, and in-mast furling mainsails. 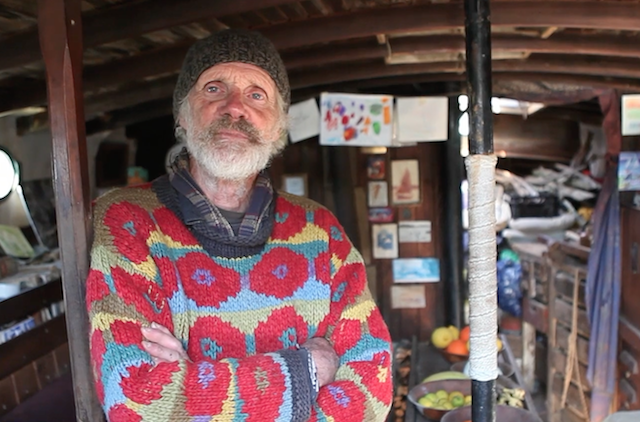 Asking prices are consequently rather high, especially for boats lying in European waters. Most 42Es, however, are very well maintained and hold their value well over the long run. Fortunately, the best bargains are in North America. 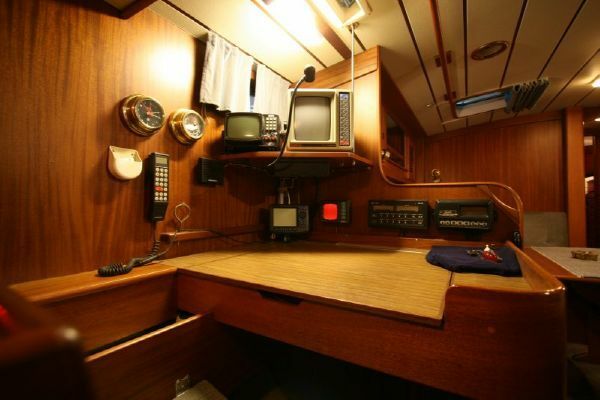 If you have your heart set on a boat like this, be prepared to act quickly if one comes on the market near you.